Living Area 1552 Sq. ft. 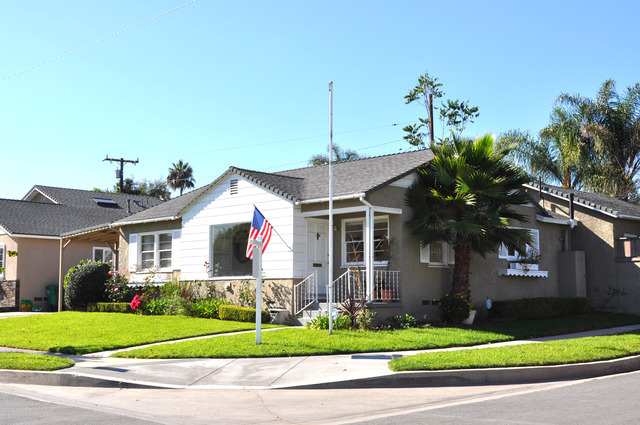 Welcome to 2209 Faymont Avenue in the highly desirable community of Manhattan Beach. Charming in every way, this 3 bedroom and 1.5 bath home features a gracious 1,522 sq. ft. floor-plan that features a Family Room with stone fireplace & cathedral wood beam ceilings, a Formal Living Room featuring a built-in credenza, Dining Area, and Gourmet Kitchen with granite and custom built-ins. Moreover, this one-level property on a corner 5,940 sq. ft. lot features a private landscaped rear yard, and spacious concrete patio perfect for entertaining. Although tax records state the house was built in 1950, the home was extensively remodeled and added to in 2003 and now boasts crown molding, new light fixtures, forced air heating, copper plumbing, designer paint, and much more. Situated on a wide, tree-lined street in a highly sought after neighborhood, this newly staged home is close to award winning schools, Polliwog park, the Adventureplex, the Manhattan Village Shopping center to name a few and has convenient freeway access. This is a home you will LOVE to live in!